Hope you all enjoyed your weekends! 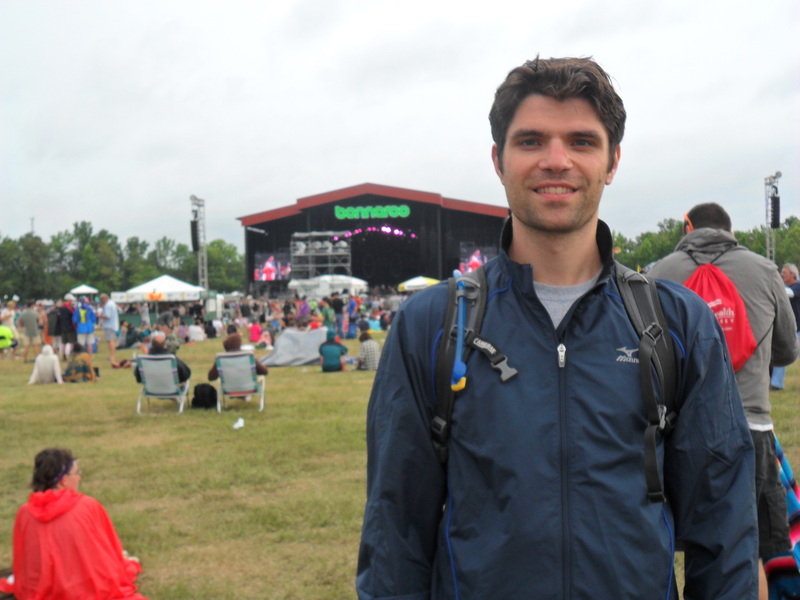 Here we are for the final day of Bonnaroo recaps. After this I promise we’ll get back to regular posts about lactic thresholds and fartleks and all that other fun stuff. OK! So when I last left you I had just danced my pants off at Skrillex well into the night. It was probably after 5 am by the time I went to bed (UNHEARD OF for me for those who know me well). Everyone was so beat from Saturday, the whole camp slept until 10:30 am (also UNHEARD OF for me). When people started emerging from their tents there definitely looked to be some fallen soldiers. It has also rained over night so everything was wet and damp and markedly more dreary than the previous morning. We started off with coffee and then Ben made everyone a hot breakfast of eggs and corned beef hash (which I am told you can find in the “canned meats” section of the supermarket. I had no idea such a section even existed but I might brave it to go after corned beef hash. Unfortunately, I glanced at the nutrition facts and almost cried so we’ll see). We lazed around camp well into the afternoon. The on and off rain wasn’t inspiring anyone to run into Centeroo any earlier than necessary. We had planned to go in early and do Splash-a-Roo (the giant waterslide) but it was too cold for that now. Mike and I finally got our butts in gear to head into Centeroo to see Ben Folds Five. I was pretty excited to see them playing together (I kind of thought they broke up… did I imagine that? Maybe I did). They played a really fun set and we did a fair amount of singing along. 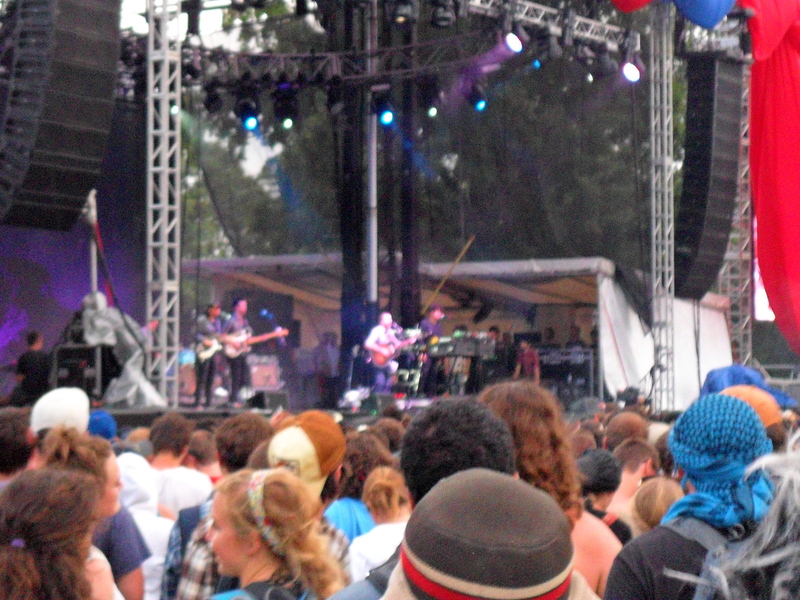 After Ben Folds Five we wandered over to the What Stage to see Bon Iver. My charming story about Bon Iver is that I was pronouncing it TOTALLY wrong for a while (think like the most American way you can pronounce it) and Mike never corrected me. When I finally learned that it was French I was pretty embarrassed! None the less, excellent show. I may have dozed for a bit on the lawn. It’s perfect music to have a feist. The rest of the group was hoping to make it in for Bon Iver, but it didn’t happen for them. They decided to save us a spot for Phish while Mike and I went to a couple other shows we wanted to see. Unfortunately, two shows we really wanted to see were playing at the EXACT same time slot so we had to split our time. 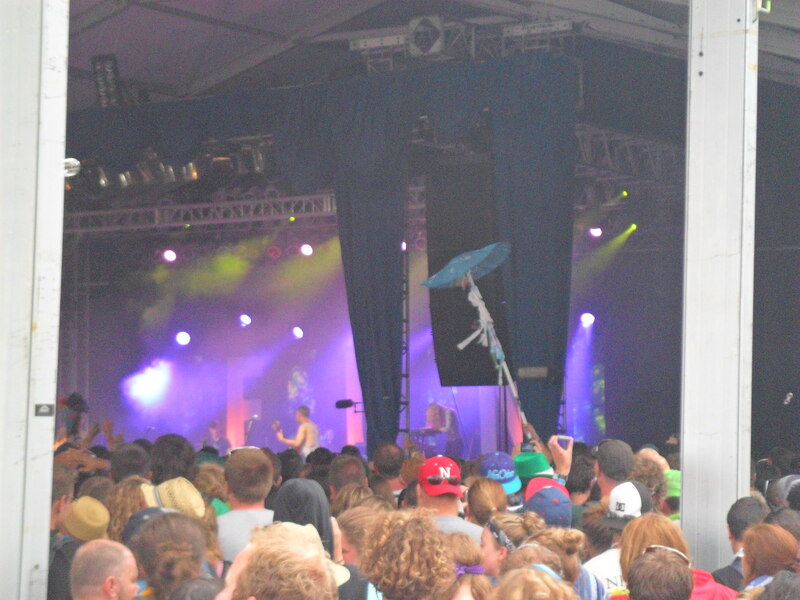 We headed over to the That Tent to see Fun.(. It’s really hard to punctuate my writing when the band’s name include punctuation!) Amy hadn’t gotten a chance to see them in Santa Fe the previous week because the show was cancelled so I took a video of “All Alone” for her. I wanted to take one of “Some Nights” (which apparently is her fav) but they didn’t play it in the time we were there. They were so good. I am loving them right now. Listening to their albums over and over and over. After seeing the first half of Fun. we went over to catch the second half of The Shins on the Which Stage. I, like many people I am sure, was pretty interested in The Shins once Natalie Portman said they would change your life in Garden State (I grew up in New Jersey so this movie was like my autobiography… well not really. But I really liked it a lot). After the Shins we reunited with the group back at What Stage for Phish. The rain was coming down pretty steadily now and luckily the others had gotten a picnic table under a tent to watch the show. I’ve never seen Phish before and had been hearing pretty much all weekend how if I’ve never seen them live I “just don’t get it”. I was hoping to get it after this show. I enjoyed their show a lot. They even brought out Kenny Rogers at one point (though I did see one guy having a freaking out saying “He’s trying to be Jerry!!! You just don’t DO THAT!!! !”… omg, hippie meltdown). The rain put a slight damper on the show and I wasn’t able to get any clear pictures (sorry… I tried but they’re all super blurry). So instead here’s pictures of Mike and I in our rain gear. Jam bands are definitely really entertaining though, so I’m glad I got to see them! 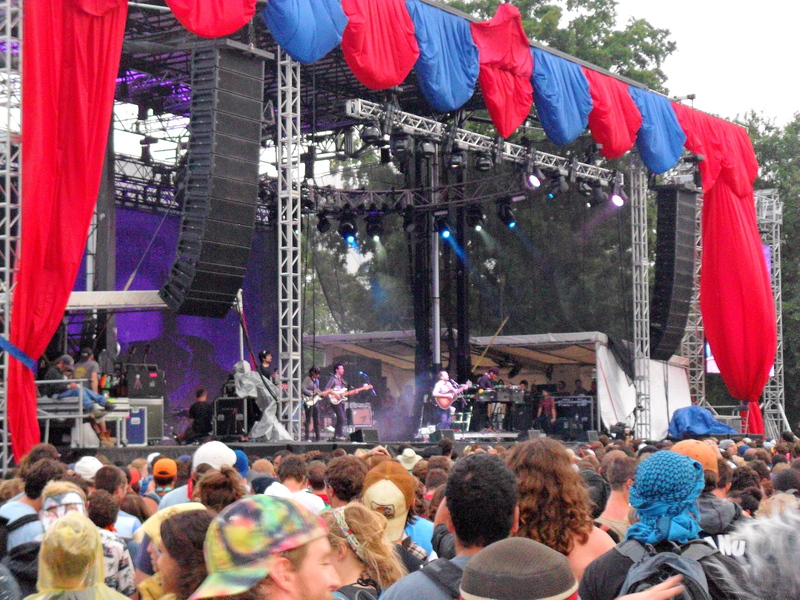 After Phish, we headed back to camp and I called it a Bonnaroo. 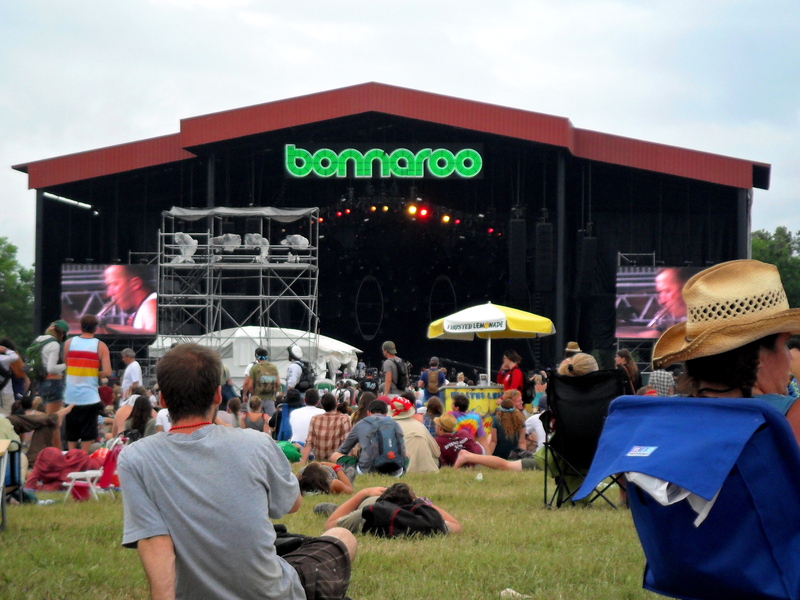 It’s possible to do Bonnaroo on a tight budget. I decided to consider this my “vacation” for the summer and even though tickets are expensive (I ended up paying a little under $300), I was able to swing a really fun vacation on a pretty small budget. In addition to the ticket, I spent about $100 on other supplies we needed and about $70 while I was there. This was doable because I ate most meals at the campsite (I only bought maybe 1 meal per day in Centeroo) and I don’t really drink much. I imagine if you wanted to be drinking a lot in Centeroo, it would be harder to maintain a budget. Prepare for all kinds of weather, not just excessive heat. 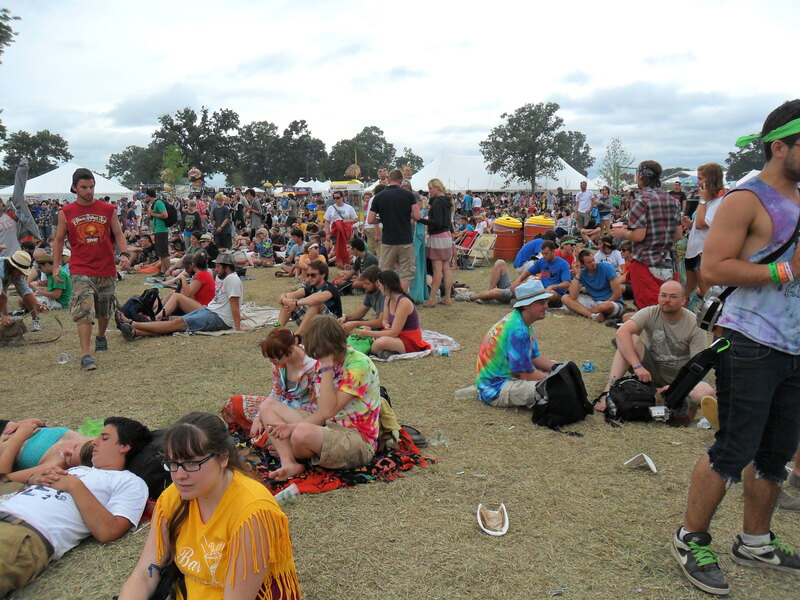 Yes, it is normally really hot at Bonnaroo. So all of us brought minimal clothing. But this year, it was unseasonably cool and I spent most nights wishing I had brought a pair of pants. THANKFULLY I did bring a sweatshirt and a blanket for our tent. 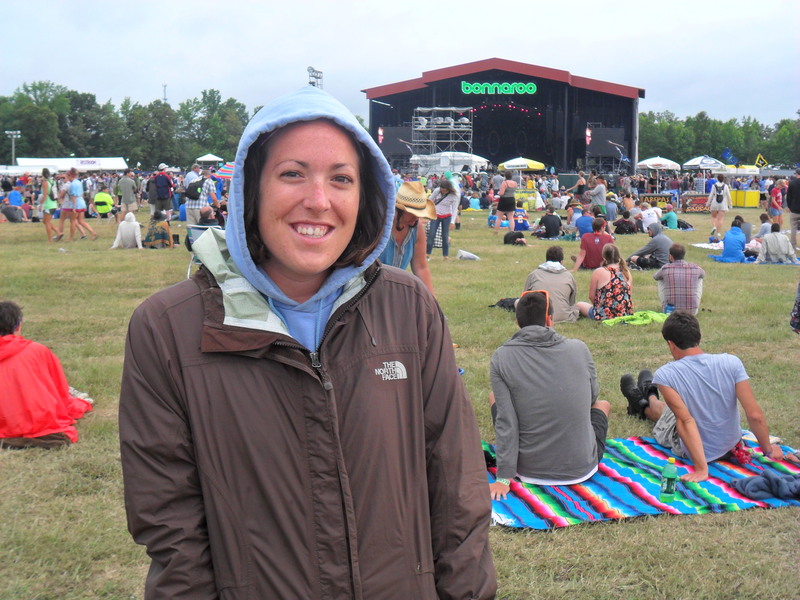 Rain didn’t ruin Bonnaroo quite like I thought it would. It’s amazing how you roll with stuff in these kinds of situations. I just swapped my flip flops for the junky slip ons I bought (which might actually be my new favorite pair of shoes… unclear), threw on my rain jacket and I was good to go. 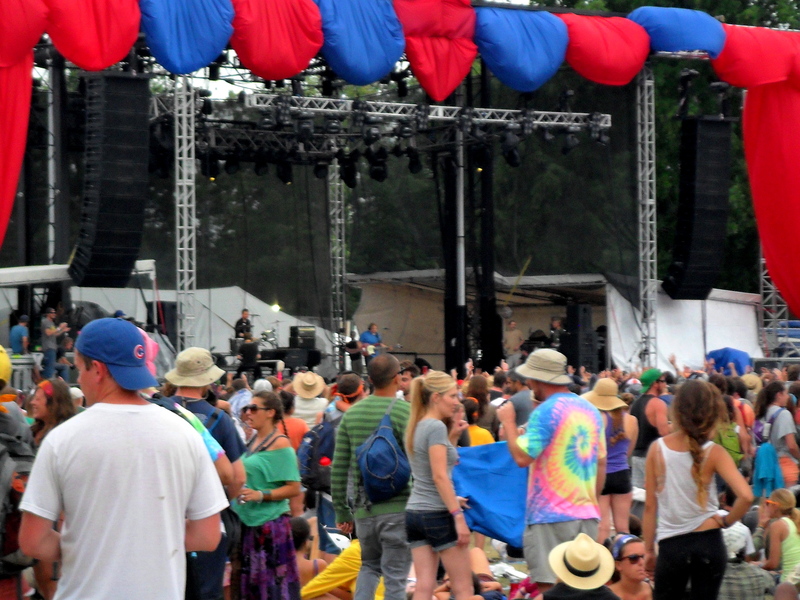 I went to Bonaroo like two years ago (I believe), and it was fun. But it rained (hard) the entire first day! Nothing like sleeping in mud, but it was great seeing so many awesome bands in one place. 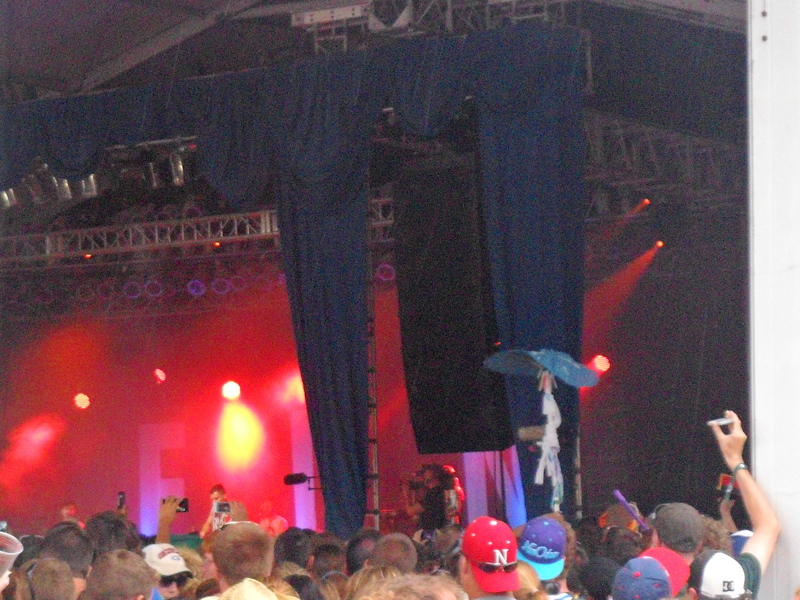 Bon Iver was there too, and I was so impressed how lively his show was for an “acoustic” guy. Oh and instead of Skrillex it was Girl Talk. Fun times and it sounds like you had an awesome time too. Thanks again for sending that video! It made my night! I still can’t believe all of the crazy acts that were lined up. 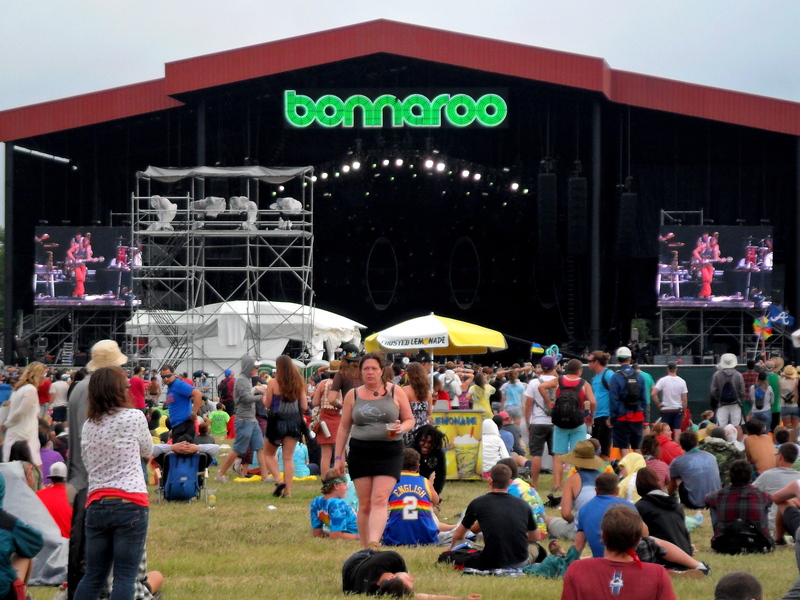 I’ve never looked into Bonnaroo, but I have been wanting to go to a music festival. It is a little far, but it might be worth considering! Thanks for your lively recaps!